These power supplies are D.C. regulated, stabilized, short circuit and overload protected, easy and safe to use as a power source for electronic equipment. 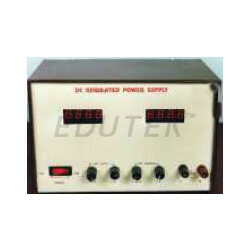 The power supply can be operated in either constant voltage or constant current mode. Both voltage and current are precisely regulated with low output ripple.Voltage and current readings are displayed on two separate 3½ digit meters. Output voltage, single or double, is continuously adjustable from 0 to 30 volts by coarse and fine controls. Accuracy of DPM : ± 0.2% of readings, ±2 least count. Ripple : less than 3 mv r.m.s. Input Voltage : 230 volts ±10%, 50 Hz. Capacity 1 Amp.